Memphis, 1939. Twelve-year-old Rill Foss and her four younger siblings live a magical life aboard their family's Mississippi River shantyboat. But when their father must rush their mother to the hospital one stormy night, Rill is left in charge - until strangers arrive in force. Wrenched from all that is familiar and thrown into a Tennessee Children's Home Society orphanage, the Foss children are assured that they will soon be returned to their parents - but they quickly realize the dark truth. At the mercy of the facility's cruel director, Rill fights to keep her sisters and brother together in a world of danger and uncertainty. Aiken, South Carolina, present day. Born into wealth and privilege, Avery Stafford seems to have it all: a successful career as a federal prosecutor, a handsome fiance, and a lavish wedding on the horizon. But when Avery returns home to help her father weather a health crisis, a chance encounter leaves her with uncomfortable questions and compels her to take a journey through her family's long-hidden history, on a path that will ultimately lead either to devastation or to redemption. Based on one of America's most notorious real-life scandals - in which Georgia Tann, director of a Memphis-based adoption organization, kidnapped and sold poor children to wealthy families all over the country - Lisa Wingate's riveting, wrenching, and ultimately uplifting tale reminds us how, even though the paths we take can lead to many places, the heart never forgets where we belong. 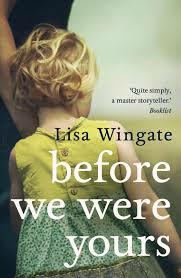 If you enjoyed Before We Were Yours, check out these other titles similar to the rocky and touching domestic themes of Lisa Wingate. When 62 orphans and abandoned children leave New York City on a train headed out West, they have no idea what to expect. Will they get separated from their friends or siblings? Will their new families love them? Will a family even pick them at all? The novel tells the story of Dr. Wilbur Larch-saint and obstetrician, founder and director of the orphanage in the town of St. Cloud's, ether addict and abortionist. This is also the story of Dr. Larch's favorite orphan, Homer Wells, who is never adopted. Penobscot Indian Molly Ayer is close to "aging out" out of the foster care system. A community service position helping an elderly woman clean out her home is the only thing keeping Molly out of juvie and worse . . . As she helps Vivian sort through her possessions and memories, Molly learns that she and Vivian aren't as different as they seem to be. Molly discovers that she has the power to help Vivian find answers to mysteries that have haunted her for her entire life - answers that will ultimately free them both. Marianne Neumann takes a job as a placing agent with the Children's Aid Society in hopes of finding her younger sister. In 1858 New York she finds it's not always easy to offer children a better life. Former schoolteacher Andrew Brady suffers from a grief that won't go away - and keeps hidden a secret from his past. As the two team up to place orphans across Illinois, a shocking tragedy threatens their work - and changes one of their lives forever. View more suggestions for Before We Were Yours.